Summer will soon rear its head, and boy am I looking forward to a more sunny disposition. 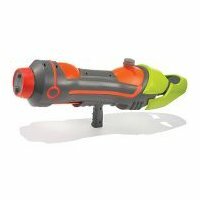 The 32 Foot Water Blaster will be perfect for any poolside activities if you happen to hold a party then. This water bazooka uses air-powered pump action to safely fire 32′ streams of water, allowing you to drench your target from long-distance. The gun has two nozzles that rotate as the gun is pumped, firing a wide spray to soak multiple combatants simultaneously. The stock rests comfortably on your shoulder, preventing excessive kick, and the smooth pump-handle allows rapid fire. The barrel holds up to 1 3/4 quarts of water and is easily filled under a faucet or spigot. Made of ABS plastic. Perfect for kids as well as adults who are still kids at heart, the 32 Foot Water Blaster offers you a splashing wet experience for $49.95.